This stir fry goes well with cooked rice, buckwheat noodles, or rice noodles. Fry the peanuts, red pepper flakes and a dash of salt in 2 teaspoons of peanut oil until they are golden. Remove from heat and set aside. Once cool, chop roughly. 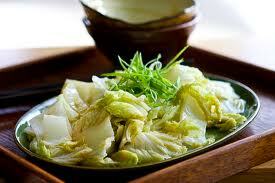 Stem the cabbage and cut stems into 1 inch pieces. Cut leaves into large chunks. Set a large pan or wok over high heat. Add 2 tablespoons peanut oil and roll it around the sides. When hot, add the garlic and ginger, and stir-fry for 1 minute. Add the cabbage stems and cook until wilted and glossy. Add the leaves, soy sauce, cornstarch mixture and cook for 1-2 minutes more or until the leaves are shiny and glazed. Add chopped peanuts, toss, and serve.